Some time ago, I offered to teach my lovely partner how to solve a Rubik’s cube. She agreed to my tutelage. And so we embarked upon the process, me as teacher, her as student. If you are ever looking for a way to break up with your significant other, I highly recommend attempting to teach them something as annoying as solving a rubik’s cube (or anything at all actually). Thankfully we survived the ordeal and she learned how to solve a rubik’s cube. 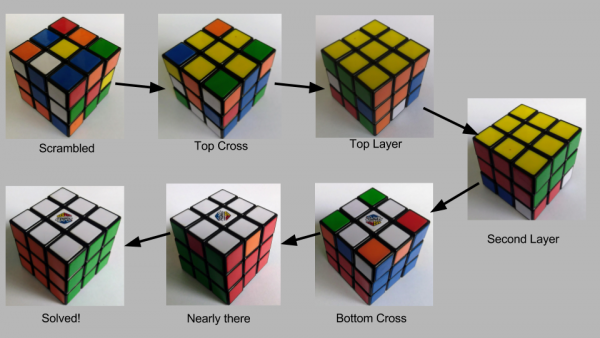 There’s really only one way to teach someone to solve a Rubik’s cube. Step by Step. Once they know how to do step 1, move on to step 2. Master step 2, on to step 3. Only once you absolutely know how to do step 3 can you progress to step 4. This is Mastery Learning. It’s how we naturally teach people things. When you teach someone to tie their shoelaces, first they need to learn to cross over the laces, threading one under the other. You would never say “Sorry, times up, you haven’t got that yet but we have to move on to bunny ears now.” The idea is ludicrous. Yet in classrooms around the world teachers are walking into classrooms and saying the following. But what if a student isn’t ready? What if she was sick yesterday and missed it? What if they daydreamed through the last lesson? This is the day that a student who previously loved this subject gets a little lost. Falls a little behind. Then a little further behind. All because “we needed to move on”. We’re teaching individuals, not a class. We can finally untether our students from a strict timetable of teaching by allowing them to access explicit instruction at their own pace via video. Students can control how fast they learn, where they learn, when they learn. Moving instruction away from the front of the room and onto a student’s screen means that the teacher has more time to help individuals. More time for feedback. More time for… mastery. But we can’t do mastery learning. There is a big difference between teaching and learning. I can “teach” all the content but that doesn’t mean everyone will learn all the content. Not every student is capable of learning at the same speed, in the same way, at the same time. But we need to give them the opportunity. Mastery learning is just that. Opportunity.